On Aug. 5th, the Times of London published an article (pay wall) titled ‘Refugee camp hit as Israel admits it broke truce’. However, the article didn’t include any information even suggesting that Israel had “admitted” breaking the truce. Indeed, news sites reported that the time of the attack (aimed at a senior Hamas operative) was clearly in dispute. After several complaints to Times editors, they agreed to revise the headline. We commend Times editors for their positive response to our complaint. But it doesn’t say anything about whether Israel broke the truce or not. Does that mean one can assume Israel broke the truce? The correction needs a correction. Israel attacked an area that was predetermined NOT to be included in the truce. The truce included only a different part of Gaza. Again, either lazy, ignorant, or malicious. Take your pick. Why is there an internationally supported refugee camp permanently housing non-refugees? Perhaps the Times of London can explain how the Arab Palestinian refugee racket requires emptying the wallets of gullible western donors to further war aims and how the meaning of the term ‘refugee’ has been corrupted to accomplish this in order to support the TImes’ headline’s assertion of the attacking of a ‘refugee camp’. 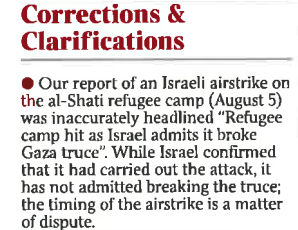 It’s not much of a retraction as it leaves the idea in the readers mind that the evil juices attacked a refugee camp. In fact id go so far as to say it’s no retraction at all. achievable and the body awareness that leaves you feeling relaxed and rejuvenated. They come in many shapes of conventional domestic items such as cell phones, lip sticks, etc. to separate the grain and husk of rice and soybeans.